Jane Friedman was CEO of HarperCollins Publishers Worldwide before becoming co-founder and CEO of Open Road Integrated Media, a new company that produces and market ebooks. She discusses the future of the ebook industry in this informative lecture and Q&A at NYU. There's little for me to disagree with, except I think it's a mistake to try and compare the digital versions of anything with the "standalone" physical (paper) product. Though Friedman's suggestion of a trade paperback pricing standard is more enlightened than treating ebooks as hardcovers. And she says up front she's open to changing her mind if market forces so dictate. Compare an episode of House that you can watch for "free" on broadcast TV or Hulu. You can also rent it through Netflix for around $2.00. Or pay a ten dollar premium on top of that to own the DVD. Which lots of people do, even if they'll never watch it enough times to amortize the cost. Renting's fine with me. Pretty much the only DVDs I buy are anime titles going out of print. The scarcity threat. I'm sure at the heart of this behavior is a primitive pack-rat mentality about hoarding and possessing. We happily pay a premium for "things." Not data. Owning data is like owning smoke. If the typical trade paperback price is $15.00, then minus the ten buck "hoarding" premium puts the price at $5.00, or more in line with mass market paperbacks, which are also not intended to be hoarded. And that's non-DRM. There's also the "sharing" premium enjoyed by books and CDs and DVDs. My local library rents DVDs for a dollar. Books and CDs are "free" (beyond taxes, but you bought a TV to watch "free" TV). When I was growing up, any book in the house would be read by everybody in the house, and then often donated to the library to be read by hundreds more. And when I was in college (during the late Bronze Age), there was always a kid in the dorm who had a nice stereo system, including a high-end turntable and tape deck. So if somebody you knew had an album you liked, you bought a cassette, borrowed the album and made your own mix tape. I wonder how much of such "borrowing" goes on with physical books, CDs and DVDs, versus the typical Kindle owner or iTunes subscriber (with and without piracy factored in). But the most brutal realization for publishers may be that digitization has shifted the value of status seeking and signaling from the content to the device. Your album collection doesn't impress as much as your MP3 player. Your bookshelf doesn't impress as much as your ebook reader. Being infinitely reproducible at almost zero cost puts the value of hoarded digital content at close to zero. Digital pirates hoard so much because the added value of each file--both in real and psychological terms--is so low, and so they end up hoarding more than they could possible consume. Content sharing and social networking software could address that. But making that work would require a significant rethinking of the bad unintended consequences of DRM and the good unintended consequences of technologies like text-to-speech when assessing what people are really paying for. Even the diehards at the RIAA won't deny that pretty much the whole point of a boombox is so that other people can hear what you are listening to. For example, combine social DRM with managed file sharing. When enabled, anybody within WiFi or Bluetooth distance could preview your stored ebooks (or your marked selections). Free advertising for the publisher while broadcasting your literary tastes and marking your social status. This suggests a value in backlists and "classics" other than reading. I can't help rolling my eyes when people post those "favorites" lists invariably salted with the egghead titles everybody was supposed to read in college but never actually did. Or if they did, because they had to and never will again. I cheerfully admit to being a cynical literary populist who puts a premium on "entertainment." But perhaps ebook publishers should stop treating their readers solely as consumers, and rather as status-seeking snobs at a tony cocktail party, who want their purchases to say (in part), "Look at me!" And at the other end of the social spectrum, as introverted otaku desperate for electronically extroverted ways of sharing their obsessions with other like-minded geeks. Not to mention all those writers with their interminable works-in-progress who could now show, not just tell! The theme for the closing credits roll (called the "ED" in anime) of Hellsing (original series) is "Shine" by Mr. Big. Vampires used to be evil. Then they turned into bad boys (Spike), or good boys except when they were bad (Angel), or at least functionally amoral (Milada). Then Stephenie Meyer came along and her good-guy vampires out-Jack Weylanded Jack Weyland! I say it's time for some dark contrarianism. 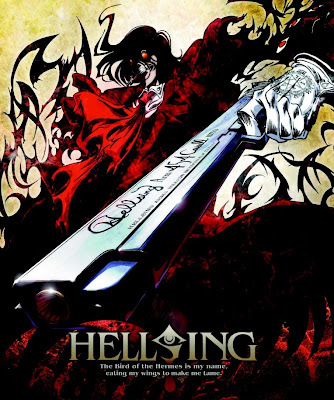 Hellsing [sic] is as contrarian as they get. Granted, it's far from perfect. Newbie Scooby Seras Victoria deserves more character development, and I would put Integra Helsing's backstory up front. A little subtlety in the monster-killing department wouldn't hurt. I prefer the 2002 TV series to the gorier Ultimate OVA, even though veteran screenwriter Chiaki Konaka is vilified in some quarters for his creative additions to Kouta Hirano's manga. In any case, both get way too carried away with the whole X-Files conspiracy meme (which Japanese SF writers love). The Catholic Church is a big part of the conspiracy as well, but as with the Grand Inquisitor in Witch Hunter Robin, you never get the feeling that there's some hidden agenda at play. It's just that as a worldwide religious organization that's actually organized, the Catholic Church coolly fits the narrative bill. I like the idea of a Buffy-type series where the vampire slayer allies, not with good Angel, but evil Angel. Plus the Miltonesque implication that Alucard isn't simply "devilish," he is the devil. Like Lewis's Screwtape (and Buffy's Spike), he's appalled by modern evil because it is so nihilistic and dull. Lesser demons get dispatched with Victoria's 30mm "Harkonnen" shoulder-fired cannon or Alucard's distinctive .454 Casull Longslide. It takes a real villain to amp him up to full-vamp mode. The anime series could be easily stripped of the more flagrant anti-Papism and reset in the U.S. It would work well as a live-action series with the same irreverent tone as Reaper (the most theologically sound show on television), which also features a devil (the delightful Ray Wise) you love to hate. And now that I mention it, Reaper is out on DVD. Once you get past the first couple of monster-of-the-week mode episodes, it turns into one of the smartest religious satires since The Screwtape Letters. UPDATE: watch the Hellsing ED by Mr. Big. Doug Gibson has posted a longer version of his earlier essay comparing and contrasting Twilight and Angel Falling Softly. Microsoft Reader is the only ebook reader that automatically hyphenates, a feature that really improves the "book feel" of the display in full-justification mode. It probably leverages the hyphenation module from Microsoft Word, but I wonder (linguistically and typographically) if purely algorithm-based hyphenation would be "good enough" for devices like the Kindle. Such an algorithm would look for common prefixes and suffixes and double consonants and the like, and then use a few arithmetic formulae to calculate the maximum kerning and word-spacing boundaries and a simple decision matrix to decide if and where to throw in a hyphen. Japanese character fonts are non-proportional. "Lined paper" for writing kanji is slightly modified grid paper. When typesetting Japanese, justification (the bottom margin) is by default. "Words" can wrap anywhere. You just keep reading characters until you hit a punctuation mark. It's not as confusing as you might imagine. My own feeling is that other than the most glaring violations of the basic syllable structure of the language, most readers would scan right through a "misplaced" hyphen and not notice it unless they stopped and thought about it. Questions of redemption dominate the climax of both tales. In Angel Falling Softly, young Jennifer is clearly a vampire. Rachel's choice will lead, it seems, to her losing her daughter. Milada's decision to help her is as much for having another eternal companion as it is for pity. She's lonely. In fact, Milada sensibly asks Rachel why she worries about Jennifer's death if she knows they will be together after death. In Twilight, Renesmee's birth in Breaking Dawn underscores the big question: If a monster creates life, isn't there a creator for the monsters? Angel Falling Softly can be read online (free), or purchased as an ebook or paperback. If you're a foreign head of state. 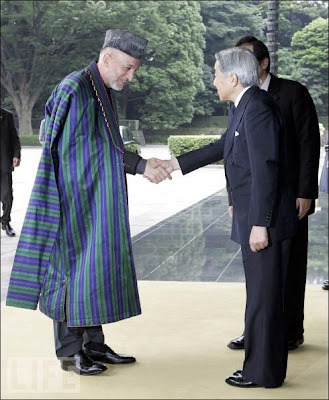 Say what you will about his abilities to conduct free and fair elections, but Hamid Karzai knows him his diplomatic protocols. Besides, as Billy Crystal would put it, he looks marvelous. As I recount here, once he got all that war stuff behind him, even Emperor Hirohito wasn't a very uptight guy. The Kindle for PC is designed as an desktop interface for the Kindle device, so when it comes to displaying PRC and MOBI files for non-Kindle owners, it is definitely NOT user friendly. However, I found after installing it that it had reassigned the PRC and MOBI file associations from the MobiPocket Reader, so double-clicking opened them in the Kindle. Kindle for PC is a really a stripped-down MobiPocket Reader with a cleaner look and the DRM stuff. The interface is so minimalistic as to be fairly pointless, except, I suppose, in order to demo for non-Kindle users the look and feel of the physical device. This is a "1.0 Beta" with emphasis on the "0" and the "Beta." There isn't even a find function. Kindle for PC, like MobiPocket, renders everything in the same font. As a test, I set an <H1> tag to sans-serif using an inline style. The style displays in MobiPocket but is ignored by Kindle for PC. It implements a KISS strategy to the max. Recompiling the LIT for The Path of Dreams reminded me that while the orphaned Microsoft Reader (last updated in 2005) lacks the bells and whistles of the Mobipocket Reader (the "find" function is particularly clumsy), and its neglected compiler is still stuck on version 2.0, it remains the most visually "elegant" of the desktop ebook readers. One of its neatest features--that other readers are inexplicably yet to implement--is built-in hyphenation. This allows the MS Reader to avoid the gaping white spaces produced by full justification and appear more "book-like." I think that even a simple algorithm-based hyphenation system (as opposed to dictionary-based) would be preferable to none. The Microsoft Reader (X)HTML is more CSS-friendly than MobiPocket and is less reliant on proprietary tags. The compiler could easily be modified to crank out ePub. With a little investment, Microsoft could produce a cross-platform ePub platform that could turn every Windows Mobile product into a universal ebook device based on open standards. Microsoft might be thinking along those lines, as it recently updated the Reader for Windows Mobile (not the desktop version). Moreover, the announcement of a partnership between Tokyo-based publishing giant Shueisha and Microsoft to distribute emanga on mobile phones suggests Microsoft is taking the platform and the market seriously this time. If management could indeed be reduced to a few simple principles, then we would have no need for management thinkers. But the very fact that it defies easy solutions, leaving managers in a perpetual state of angst, means that there will always be demand for books like Mr. Covey's. The secret to Covey's success is the same for anybody packaging advice that most people would instinctively recognize as commonsensical, but have great difficulty adhering to. Hence diet books and Dr. Laura and practically all political punditry. In fact, you could quickly get to the point where simply listening to the advice--let's call it a sermon (Covey is a Utah Mormon, after all)--becomes the whole point of the exercise. Perhaps there is utility in being reminded (say, every Sunday) that a particular set of ideals exist and you ought to be working toward them, even if you don't plan on arriving at the destination anytime soon. Church as self-help window shopping. The question of whether a diet (economic or otherwise) works cannot be separated from the ability of ordinary people (and governments) to follow its strictures. The perfect is the enemy of the good, and the ideal must inevitably yield to the pragmatic. My experience at organizations where Coveyisms are freely bandied about is that the people regurgitating the sermons mostly do so to relieve themselves of the burden of applying the advice to themselves. Like driving a Prius while living in a mansion. The same way it's easier (and more ideologically invigorating) to pass spankin' new health care legislation than reform Medicaid and Medicare. Or campaign against gay marriage than get all those ruttin' and divorcin' heteros to behave themselves. That's how Emerson made a living. He talked transcendentalism. He wasn't so stupid as to actually live it (not like that nut Thoreau). Rush Limbaugh is honest enough to admit that he exists primarily to draw an audience and make money for his sponsors. Because the only way to change the world is to change people, and that's pretty much impossible to do by shouting at them.